This activity makes a great center activity for spelling, sentence building writing and more. 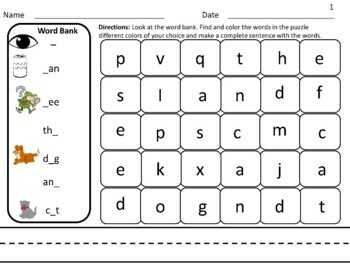 Your students will love find their words in the puzzles and writing sentences with the words in the word bank. 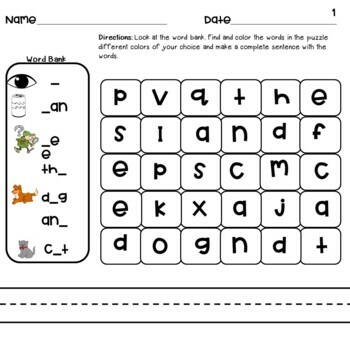 Most of the words are sight words and include some CVC words. These words and sentences are perfect for Kindergarten and 1st graders. -I can see the dog and cat. -The kids love to play. -I can see a house. -She can kick the ball. -Mom loves to sing songs. -She has a big dog. 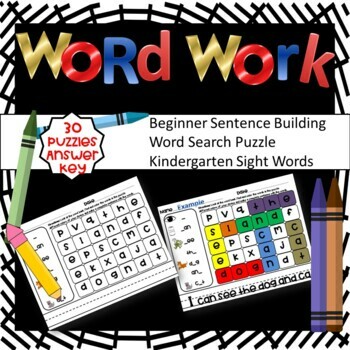 Kindergarten Sight Word Centers/ Activities | Low Prep | QR code Scrabble! Pre-K Sight Word Centers/ Activities | Low Prep | Hands On FUN! Kinder Sight Word Q-Tip Painting | 52 Dolch Sight Words | 2 Letter styles| FUN!! If you enjoyed this activity, please leave feedback. TPT gives credit for feedback that can be used towards future products. The license you are purchasing is to use this resource only in the classroom of the teacher who purchases it. Please purchase multiple licenses for a discounted price if this is for more than one teacher. Thank you for your honesty and for respecting my work.